I wanted to bring in extra light to our yard and was looking for something a bit more refined then the store bought tiki torches. 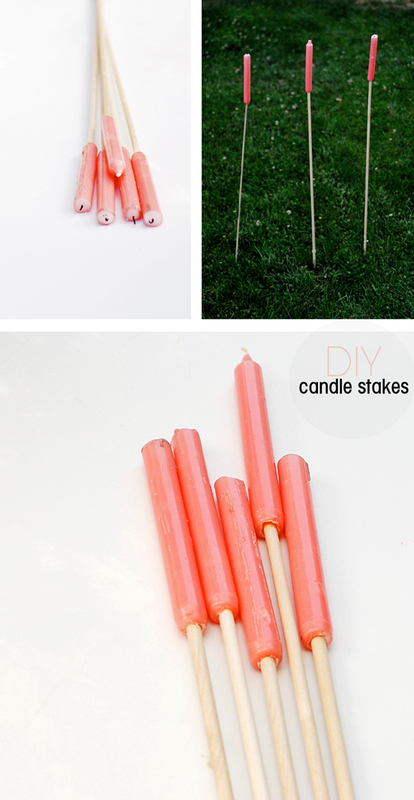 So I made my own candle stakes! I used a small drill bit to hallow out the bottom 1/4 of a stack of taper candles and stuck them atop craft dowels and then into the ground. It’s been an easy, affordable and pretty way to bring extra light to our extended evenings outdoors. Hooray for summer! Love this idea! Simple and elegant, which is the perfect combination. Hooray for summer indeed. What a great idea! I am definitely trying this at my next backyard dinner party. Did you try the tiki candles ? These candles look pretty and practical too. Do you have any instructions on how to make them? You can also buy these at many dollar stores. I do like the idea of getting to choose your colours, etc. Think I need to buy a drill. I keep needing one for stuff like this. you can get a really good drill that comes with screw drill bits, you will need to get one to drill holes in addition though, and its only $ 19.99 at walmart. Its the only one thats $ 19.00 its better than my husbands expensive drill is rechargeable. I love mine, lighter but not cheap made, easy to use and gets the job done. I put my raised beds garden together with it. and I’m about to build my greenhouse and this is the first tool I have ever used. My husband likes mine better than his. You don’t need a drill!! Just heat a piece of metal, the same width as your stake (possibly a wire coat hangar or a piece of wire). Put a lighter to it till the wire is hot. Place the hot wire tip into the base of your candle & and melt a bit up the middle of the bottom of the candle (enough to fit the stake into), until you melt out enough room to put the stake in. Place the candle onto the stake, making sure the top of the candle (where the flame is) is pointing straight up. Light the candle & go! How do you keep them from blowing out in the wind? Try buying some clear dispoable cups make hole in bottem and slide over the candle a bit of tape or hot glue to stop them sliding down! That way candle won’t blow out just make ya candle short enough to sit below top of cup! You can even decorate the cups to be like lead light! With just a bit of thinned down poster paint so light can shine threw! 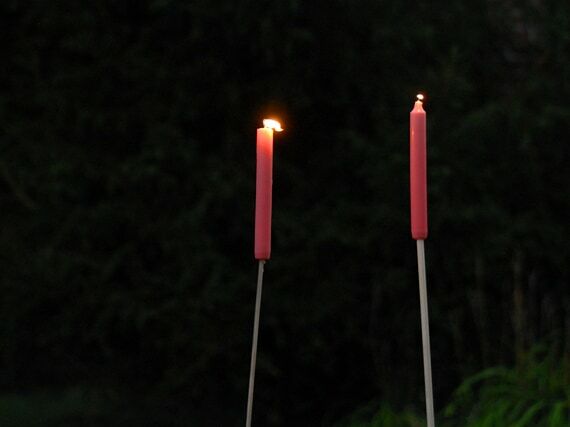 I don’t know if they make citronella tapers or not but if they do……dual purpose: light and maybe fewer mosquitos! These are incredibly unsafe! If left for too long the wax melts down over the dowel and well, you got a candle that is going to burn right down to the ground where more wax is waiting to help it start a fire. We discovered this one 4th of July, with the store bought versions of these. While there were people around until the wee hours of the morn, no one noticed until they were very close to the ground so thankfully catastrophe was averted. Had it not been noticed there most certainly would have been a ground fire. Pingback: These DIY Hacks Will Make Camping A Lot Easier And More Enjoyable. Pingback: He Put Toothpaste On A Paper Plate. This A Clever Trick That Everyone Can Benefit From! Thanks for all the great ideas and tips! Pingback: Puso crema dental en un plato de papel ¡Un truco genial del que todos pueden beneficiarse! Pingback: Ele Pões Pasta De Dentes Num Prato. É Um Truque Esperto Do Qual Qualquer Pessoa Pode Beneficiar! Pingback: Il met du dentifrice sur une assiette en carton. Une astuce qui servira à tout le monde !